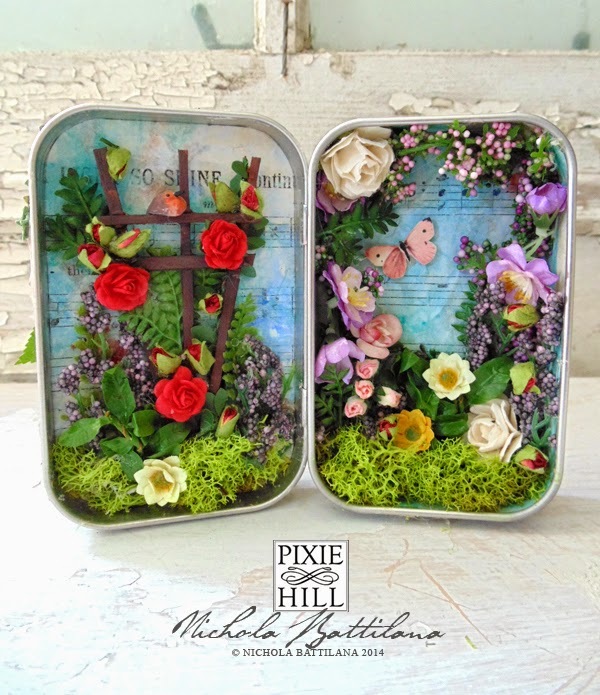 The Secret Garden tins are complete! Below is a pretty good pic of the front, inside and back of the tins. Each has a slightly different arrangement and selection of flowers and leaves and moss, but they are all quite similar. I am rather smitten with these little gardens. They are bright and cheerful... as they should be! Many of the flowers inside are from Alpha Stamps, who have a great selection of pretty little flowers. You can also purchase Blank Altoids Tins from them as well. And here's the whole lot lined up in a pretty row. 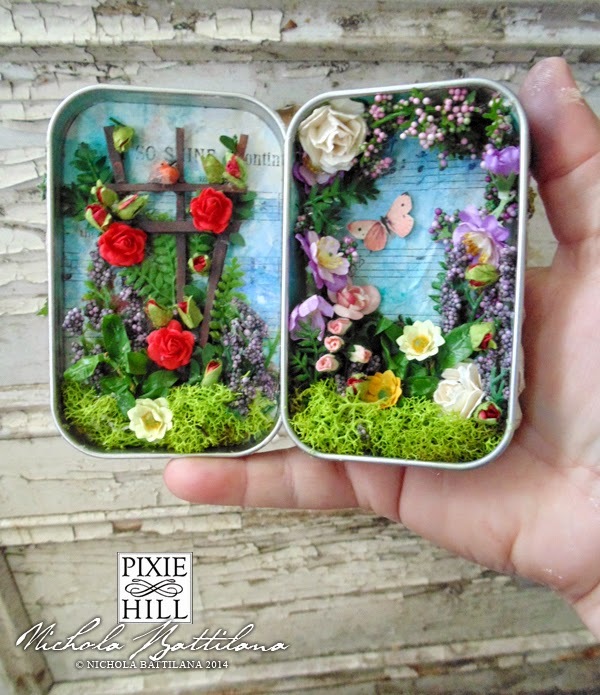 Five tins created in a all. Four are available for purchase and listed in the etsy shop HERE. P.S. A quick update on the 221B Baker St. / Sherlock tins... The very last tin, the one numbered 10/10 in fact, is now in England and will be auctioned shortly by The Undershaw Preservation Trust to raise funds toward the restoration of Sir Conan Doyle's study. This is the very last chance to purchase a tin! No others will be made. No more are available. 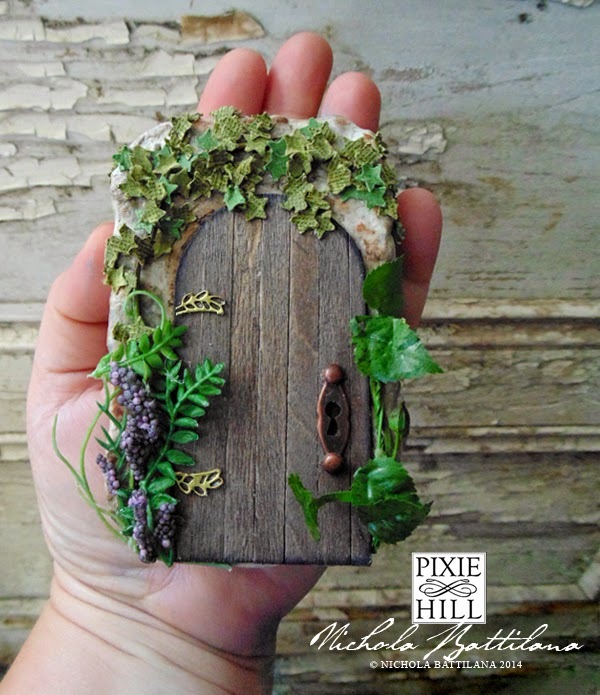 The money raised is for a great cause, helping to preserve history and honor a very important believer of faeries. I will keep you updated. 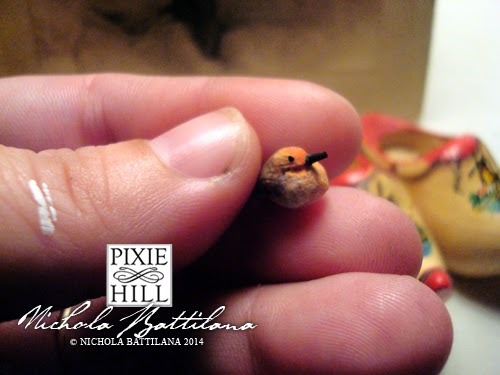 Those are so lovely Nichola! Magical! I just held a baby shower for my daughter-in-law themed around Secret Garden, her favorite childhood book. I'm still so thrilled with my Baker Street matchbox that you were kind enough to give us a tutorial to follow. Thanks - I never miss your blog - so positive. 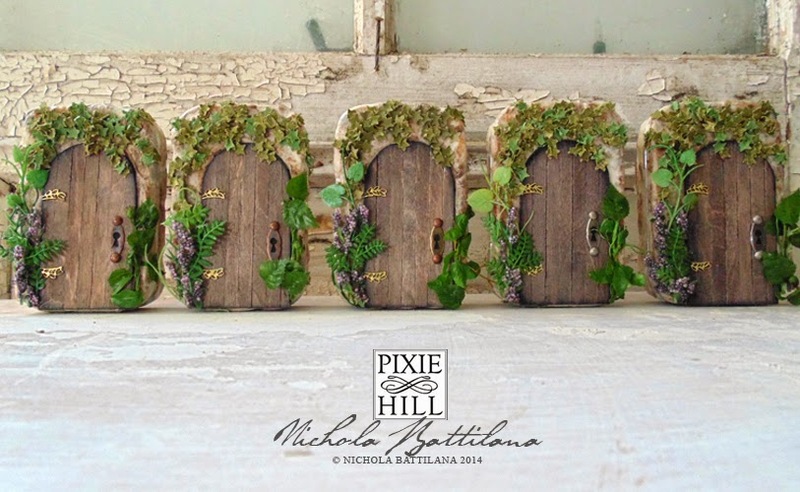 True doorways leading to enchanted worlds. . . those who end up with these tins in their possession are going to experience pure bewitching in their lives. . . it is the gift of your creative magic and never-ending wonder! These are absolutely beautiful!! LOVELVOELOVE them and will be trying my hand at making at least one of them!! Thank you for the inspiration! 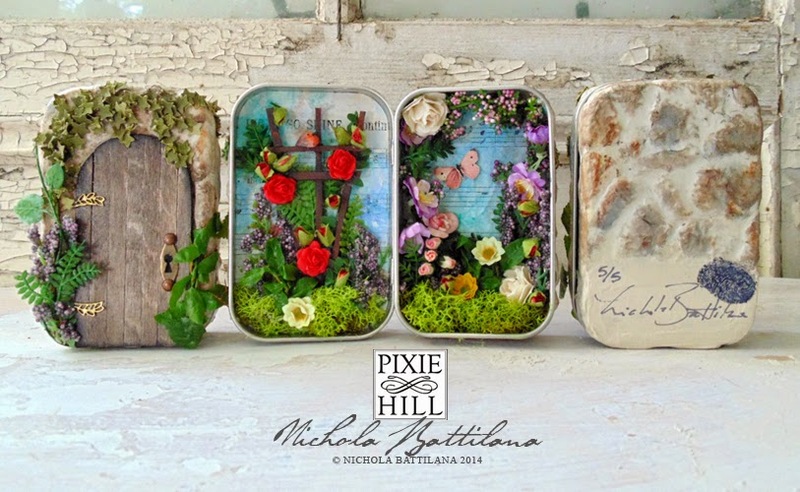 I am so smitten with these darling little tins you have created. A great job and creative!!!!! I really have no words!! These are beautiful!! What a beautiful piece of art. Thanks for sharing with us.